In the world of the crossover SUV, there’s nothing off limits. You need your vehicle to be adventurous, sporty, agile and cooperative, no matter where you go or what you do. That’s where the 2015 Toyota RAV4 comes in. The 2015 RAV4 is one of the most versatile, spacious, responsive crossovers around, which makes it a very desirable vehicle. Drivers may wonder, however, how does the 2015 RAV4 compare to other vehicles in its segment? For example, when you compare the 2015 Toyota RAV4 vs 2015 Nissan Rogue, which vehicle comes out on top? This is a common comparison because both vehicles look so incredibly similar and boast quite a few of the same features. 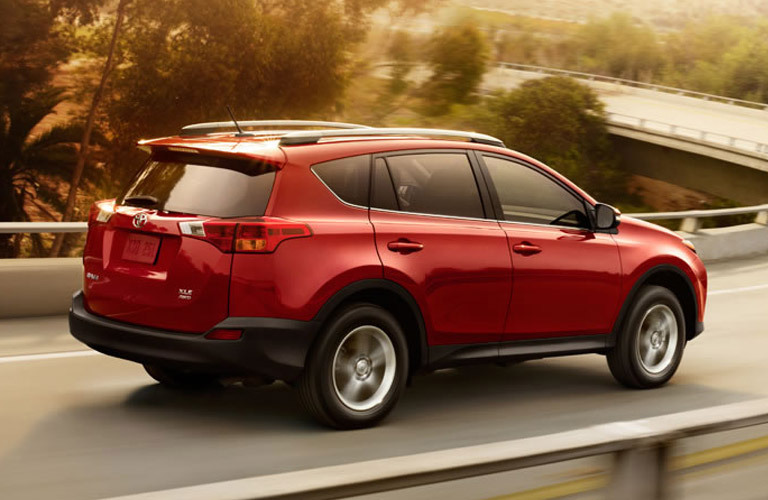 But when it comes to power, performance and space, you can’t beat the 2015 RAV4. Although the 2015 RAV4 has a slightly less efficient fuel economy rating than the Rogue, it’s not by much, and we think all of its other features significantly make up for that discrepancy. If you’re going to be doing anything that a sport-utility vehicle is meant to do, you’re going to want the 2015 Toyota RAV4 on your side, bar none. Get it today at Attrell Toyota! You can give us a call to set up a test drive or just come by our lot. The 2015 Toyota RAV4 Brampton ON comes standard with a 2.5L engine, same as the 2015 Nissan Rogue. It also comes standard with front-wheel drive, but has available four-wheel drive that is matched with a six-speed automatic transmission. It also comes standard with sequential shift control, speed-sensitive steering, a double wishbone suspension, and a four-cylinder engine that makes 176 horsepower. The 60-L fuel tank adds to its max payload capacity of 408 KG. The interior is more spacious than the Nissan for passengers and has more headroom and hip room for passengers. Talking about fun features is what makes driving the 2015 RAV4 exciting, though. The 2015 RAV4 has a unique, efficient, ergonomic design that puts all other SUVs to shame. It is extremely aerodynamic, easy to handle and fun to drive. It has an easier-loading liftgate, a full-fledged infotainment system with an available touchscreen display, six speakers, dual automatic climate zone control an Toyota’s Star Safety System, all of which make the RAV4 an enticing option for any driver. See more today at Attrell Toyota!